You'll be £10.39 closer to your next £10.00 credit when you purchase Tracing Your Irish Family History on the Internet. What's this? Ireland has probably experienced more tragedy when it comes to the preservation of resources for family historians than any other region of the British Isles. Many of the nation's primary records were lost during the civil war in 1922 and through other equally tragic means. 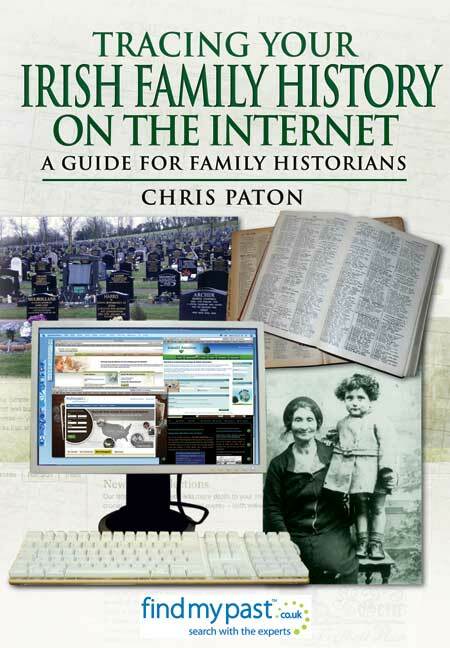 But in this new book Chris Paton, the Northern-Irish-born author of the best-selling Tracing Your Family History on the Internet, shows that not only has a great deal of information survived, it is also increasingly being made available online. Thanks to the pioneering efforts of the Public Record Office of Northern Ireland, the National Archives of Ireland, organizations such as FindmyPast Ireland, Ancestry.co.uk and RootsIreland, and the massive volunteer genealogical community, more and more of Ireland's historical resources are accessible from afar. As well as exploring the various categories of records that the family historian can turn to, Chris Paton illustrates their use with fascinating case studies. He fully explores the online records available from both the north and the south from the earliest times to the present day. Many overseas collections are also included, and he looks at social networking in an Irish context where many exciting projects are currently underway. Put simply I don’t think anyone will write a better book about researching your Irish family history on the internet. The author is an absolute expert on his subject and really has done some extraordinary work on finding sources and information, a process that is still ongoing. Absolutely essential for anyone with any interest in this subject. Despite being saddled with a "seriously major handicap", Irish family history research is no more costly or complicated than tracing ancestors from England, Scotland or Wales. Chris Paton is keen to dismiss those fears and set budding genealogists on a comprehensive and rewarding trail to the Emerald Isle. Scots/Irish genealogist and writer, Christopher Paton, has a new book which I cannot recommend too highly...it is stuffed full of tips and hints – some of which will save you money. It is not simply a list of websites but a really handy research aid with detailed instructions about how to make the most of them. Tracing your Irish Family History on the Internet is a practical guide to researching Irish genealogy online. It covers the whole of Ireland, north and south and contains case studies demonstrating how online records can be integrated with other research. Chris Paton has produced this much-needed book for researchers tracing Irish roots, pulling together all the current online resources and expert advice into one handy guide. Covering both the Republic of Ireland and Northern Ireland, it is a useful companion to Chris’s bestselling Tracing Your Family History on the Internet. While those researching for Irish ancestry may be aware that many of the island’s genealogical records were destroyed during the civil war in 1922, Chris takes the ‘glass half full’ approach, explaining family historians just need to think out of the box when tackling records in Ireland and further afield. He points out that not all research can be done online, however many records are bring transcribed and digitalised all the time, thanks to pioneering work by government agencies, local archives and volunteers, commercial websites, FamilySearch and more, ‘but be in no doubt’, the internet will certainly help provide you with one heck of a starting point.’ And this handbook is much more than a starting point too. Not just ‘a list of websites’, Chris talks us through the common pitfalls of Irish research and ways around brick walls as well as understanding the records. Covering archives, societies, commercial sites, social media, vital records, occupations and the Irish diaspora, along with chapters focused on Ulster, Munster, Connacht and Leinstar, the simple chapter headings and easy-to-read text make this a great reference book top dip into s well as a practical, step-by-step guide. If you are researching Irish ancestry, this will prove invaluable. A guide for those perplexed by the recent increase in Irish records available online. Chris Paton has produced a thorough and informative guide that will greatly assist the Irish family historian. Tracing Your Irish Family History on the Internet is, as you would expect, very much an all-Ireland guide, with as many references to websites for Northern Irish genealogy as for the Republic of Ireland. Using case studies, Paton takes great care to explain how to navigate each website and interpret the information found, as well as highlighting pitfalls such as automatic subscription renewal after a free introductory period. Tracing Your Irish Family History on the Internet is a truly comprehensive and thoughtful guide that you will return to again and again as you dig deeper into your Irish roots. Chris Paton is well known to the genealogical community as a writer for this magazine, blogger and an author. Inside are nine themed chapters on different types of records and the many online resources offering them or at least providing useful information. The result is far from just a list of useful websites: every resource is set in context and the result is an excellent guide to Irish research in general. Read it for: A concise but detailed guide to Irish research online. This guide by Scotland Scotland-based genealogist Chris Paton is well worth adding to your collection if you’re searching for Irish ancestors. And given that nearly 40 per cent of Antipodeans have Irish ancestry, I’m thinking that recommendation is relevant for quite a few of you! Tracing Your Irish Family History on the Internet is well set out and easy to follow. It covers historical sources across both the north and south of Ireland, from the earliest times to the present day. This detailed book includes help on finding vital records such as civil registration, adoption, parish registers, burials and probate, land records, census data and occupations to name just a few. There is also a chapter devoted to the Irish diaspora. Plus each category is supported with case studies that are sure to help you with your own research. I was very impressed... It was my reading material during a 14 hour plane ride to China and is highly recommended for people engaged in tracing their Irish ancestors. As well as providing an in depth exploration of the various categories of records that the family historian can turn to, the author explored holdings from both the north and the south, but equally points out what has yet to be made available online, as well as problems found within some of the material that is online. In addition he demonstrates the value of resources for Irish research to be found in Britain, and from within the worldwide diaspora, from Argentina to Australia. A genealogical revolution is currently underway in Ireland, and in “Tracing Your Irish Family History on the Internet’, Chris Paton will safely guide you through the many exciting developments now allowing us an opportunity to reclaim our ancestral past. Previously available in a limited print run at Who Do You Think You Are Live 2013 in London, where it sold out within two days, the book has now been officially released and is available to order from the publisher’s website and other outlets. Chris Paton is a genealogist and writer based in Ayrshire. He runs the Scotland’s Greatest Story research service at www.ScotlandsGreatestStory.co.uk. Formerly he was a television documentary maker and worked on history series such as War Walks, Secret History, Time Flyers and Meet the Ancestors. He is a regular writer for several British genealogy magazines and is currently completing a beginners’ guide to Scottish family history research. He also runs a Scottish genealogy news blog at www.ScottishAncestry.blogspot.com and gives regular talks to local family history societies.